The internet makes it incredibly easy for information to be found. The problem is much of the information that is found on the internet is junk. Google Plus is one of the best places, if not the best place, to find quality real estate information! Google Plus communities, such as the Real Estate Community owned by Bill Gassett, are loaded with knowledge not only to make all of us better Realtors but to help consumers by providing rich content about buying and selling homes. This is a fantastic reason to encourage anyone who has an interest in real estate to join! There have been many great articles published since Bill’s Best Google Plus Real Estate Articles May 2014 was published. Bill was actually kind enough to ask me to come over here to his blog to share my opinion on which articles I enjoyed reading the most. Here are several articles from the months of June and July that you should absolutely check out! Over the past couple month’s there has been many real estate professionals writing about Zillow and other third-party real estate websites. Most of these articles have discussed and proven how inaccurate Zillow and other third-party websites truly are! The first article, are Zillow estimates accurate by Bill Gassett is an in-depth explanation of the many problems with Zillow and their estimates. He explains the process by which Zillow uses to establish these estimates, explains why the estimates fail so often, and also gives some great reasons why real estate professionals hate Zillow. Bill’s article was just the beginning to this movement over the past month against Zillow’s estimates. Debbie Drummond, a Las Vegas Real Estate Agent, followed up Bill’s article by giving an in-depth analysis of the effect of Zillows Estimates on the Las Vegas Real Estate Market. In this article she discusses why buyer’s need to take Zillows estimates with a grain of salt, which is absolutely true. During her analysis, she found that only 8 out of the 18 homes sold relatively close to what Zillow estimated these homes were worth. There aren’t many professions out there that allow a less than 50% accuracy! Debbie’s article was followed by a great article by Andrew Fortune, “3 Reasons Why Local Real Estate Websites Are Better Than National Ones.” In addition to the excellent infographic, Andrew discusses why consumers need to use local real estate websites, not national ones. Many consumers don’t realize that national real estate websites make money by selling advertising and leads to real estate agents. There are no requirements to be advertised on Zillow and other national real estate websites, other than the willingness to pay! Andrew’s article was followed up by an article by myself, Zillow’s Home Value Estimates “Zestimates” – Accurate or Not?” . Like Debbie’s analysis of her Las Vegas Real Estate Market, I decided to perform an analysis on my local Rochester NY Real Estate Market. To no one’s surprise, less than 50% of Zillow’s “Zestimates” were relatively close to the 38 homes that were used in this analysis of recently sold Rochester homes. This article also discussed other important reasons to not trust Zillow and other third-party websites. Third-party real estate websites often have outdated data due to the fact they are not held to any National, State, or Local regulations. Four excellent articles within a month discussing the inaccuracies of Zillow and other national, third-party real estate websites. Bottom line, they cannot be trusted, and it is important that buyer’s and seller’s remember “LOCAL, LOCAL, LOCAL” when looking for real estate advice and information! I want to make one thing clear, not every real estate agent markets the homes they sell the same, PERIOD! Over the past couple months, there have been a couple excellent articles discussing real estate and internet marketing. Many real estate agents will take a listing, put their sign up in the front yard, enter the listing into the MLS (Multiple Listing Service), and wait for the home to sell! Bill comes up with another gem of an article with his “Is Your Real Estate Agent a Post and Pray Realtor”. In his post he gives many examples of a how to know you hired a bad real estate agent. These are the Realtors that are notorious for taking bad photographs, writing terrible descriptions of their listings, and don’t know how to market. Before hiring a Realtor, make sure to check out this terrific article on how to pick a Realtor! Have a real estate blog. Many real estate agents have discovered the power of having a real estate blog. There is nothing that can brand you better or show off your market expertise than having a blog. Of course if you know a little something about SEO it is even better as your content is likely to be found by consumers doing some kind of online real estate search. Seth Williams a blogger at RE- Tipster put an excellent reference together of some of the best real estate blogs at the current time. In Seth’s overview of some of the leading real estate industry blogs he groups them by collaborative blogs, real estate investing, marketing/technology, real estate economy and local Realtor blogs. Have a visible internet presence. The internet plays a huge role in the real estate industry nowadays! Buyers and sellers are beginning to their research online. A real estate agent who doesn’t use social media, doesn’t blog, and doesn’t have a website is stuck in the stone age of real estate! It is necessary and don’t ever let anyone tell you it isn’t! Karen Highland’s Real Estate and Internet Marketing article discusses the secret sauce of internet real estate marketing. Search engine optimization or SEO, is this “secret sauce” that isn’t really secret. Any Real estate agent who has taken the time to blog regularly with quality content, interact socially, and work on their websites understands what internet marketing is and the impact it has on their business! Check out Karen’s article if you don’t believe that internet marketing is a huge part of the real estate industry, I think you will change your mind afterwards! Many real estate markets across the country right now are in the midst of an extremely competitive seller’s market! Sellers are being able to “pick and choose” which of the multiple offers they would like to accept. While this is great for sellers, not so great for buyers! The good news is that there are things that can be done to help a buyer succeed in a seller’s market! First and foremost, a buyer needs to be pre-approved, not pre-qualified! There is a major difference! In the article buying a home in a seller’s market, by Lynn Pineda, she does a marvelous job on explaining what a buyer can do to help themselves succeed with their home purchase. The tips given by Lynn can prevent the heartbreak associated with losing in a multiple offer situation. 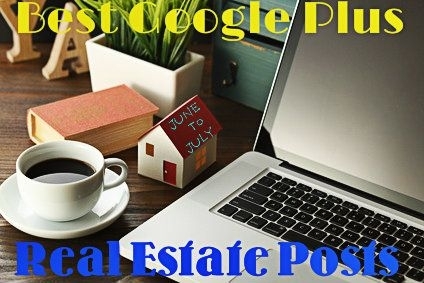 These June and July “Best of Google Plus Articles” are just a small taste of what you can expect to find on Google Plus and more specifically, in a Real Estate Community, like the one owned by Bill Gassett! If you haven’t joined, what are you waiting for? This review of what the Google Plus real estate community has to offer was written by Kyle Hiscock a top Realtor covering the Rochester New York area. Previous Article What Types of Flooring Do Home Buyers Prefer? What a great round up of wonder real estate articles. I love this idea of a monthly or bimonthly recap. Thanks Debbie. I thought Kyle did an excellent job nailing down some of the better content found in the Google Plus real estate community! I have never read better information, in fact I print them and put them in a three ring binder for my clients. When they need information, I use you to educate. One email I do read!!! Great Job!!! Well this will take me a while to get through! Thanks for the great write up Kyle and excellent information. Thanks for the mention Bill – I’m glad to have connected and learned more about your blog this past week. Keep up the good work buddy! Great content and love it is all in one article. Good Stuuf!! Bill: Great idea … Great job of finding newsworthy information and articles. Great format. Okay .. you get the idea. I just think this is GREAT!! Thanks Gene. These kind of posts where you recognize multiple people are always fun and interesting! Bill, Thanks for letting me put together the best Real Estate Articles of June & July from Google + and thanks to everyone else for the compliments as well! Yes, Kyle has been doing a spectacular job on his articles and his presence on Google Plus.